Somerset County, NJ provides residents with a comfort of a suburb near the excitement of New York City. Large cities offer the best in culture, dining, sports, shopping, and sightseeing. You won’t find many Michelin-rated restaurants, sports stadiums, and major art museums out in the suburbs. Knowing this, many active adults still choose to reside in peaceful suburbs where they can live relaxing, low-key lifestyles. Fortunately, plenty of suburbs and 55+ communities located in them provide that tranquility with a location near all the fun of a city. Residents can easily commute downtown and return home later to an affordable, quiet home. New Jersey’s Somerset County is perfectly poised to offer 55+ adults that optimum urban/suburban mix. Living an hour from The Big Apple doesn’t come cheap, but Renaissance at Raritan Valley is one of Somerset County’s more affordable 55+ communities. This gated development of 344 condos and single family homes was built from 2002 to 2009 by Centex Homes. Franklin Township is right by Exit 9 of the NJ Turnpike and is also near the Garden State Parkway. 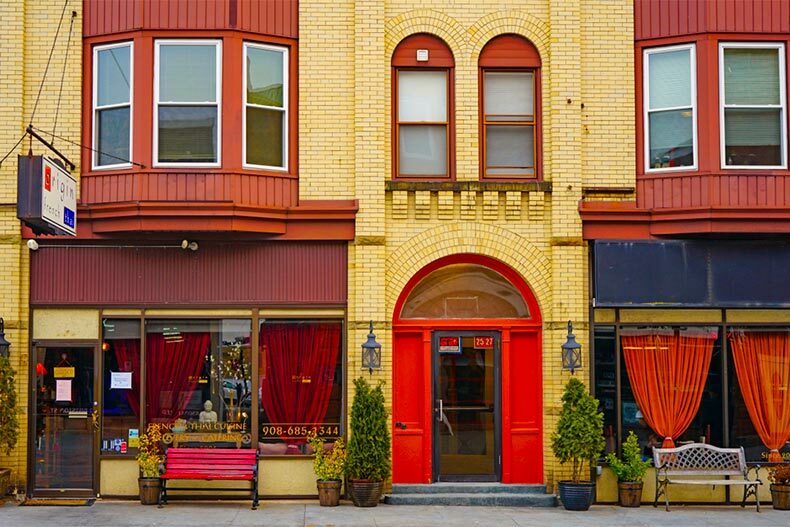 It is also less than five miles from New Brunswick, home of Rutgers University, historic buildings, theaters, and close to 50 restaurants. Renaissance’s 108 condos are housed in six buildings that range from 1,565 to 2,050 square feet. Homes have two bedrooms and bathrooms and a one-car garage. The 236 single-family homes range from 1,598 to 1,942 square feet and have two bedrooms and bathrooms, plus an attached two-car garage. The clubhouse includes an indoor pool, a fitness center with lockers and saunas, and activity rooms. Outside, there is a second pool, tennis, bocce ball, shuffleboard, a tot lot, and lakes on the property. There are also many activities and events for residents, like aqua aerobics, book clubs, casino trips, holiday parties, movie nights, and golf groups. Somerset is a town as well as a county, and Somerset Run is in the town. This large, gated active adult community has 755 condos and single-family homes built by Del Webb from 2004 to 2007. Somerset is also close to New Brunswick, but there is also plenty of shopping, theaters, and parks right in town. It has three golf courses, including Tara Greens, Spooky Brook, and Quail Brook. Like nearby Renaissance at Raritan Valley, Somerset Run is close to Delaware River attractions, which boasts recreation areas like Johnson Park and Colonial Park. The low-maintenance condos range from 1,763 to 1,781 square feet with two bedrooms and bathrooms. The single families are generously sized from 2,029 to 3,100 square feet with two to three bedrooms, two to three-and-a-half bathrooms, and two-car garages. Stone Manor, the community’s 25,000 square-foot clubhouse features a modern fitness center, indoor pool, sports lounge, and a wellness center. There is also an outdoor pool, a putting green, walking and biking trails, tennis, bocce ball and shuffleboard. Attendance at community events like casino nights, educational classes, mahjong games, parties, softball games, and trips is always high. This exclusive, gated development is being built by Premier Development, and upon completion, it will have 296 new single-family homes. It is about 50 miles west of New York City, an easy drive straight down Route 78 or Interstate 95. There are many close by shopping outlets like Bridgewater Commons, while Newark Airport is about 35 miles away. Local top hospitals include Robert Wood Johnson University Hospital and Saint Peter’s Hospital. Gateway at Royce Brook offers four models ranging in size from 2,374 to 2,975 square feet. They feature three bedrooms, three or three-and-a-half bathrooms, and an attached two-car garage. Upgrades include master suites, lofts, and two-story family rooms. When finished, the community clubhouse will have a fitness center, yoga studio, saunas, an outdoor pool, tennis, and lovely ponds on its grounds. This upscale, gated community appeals to active adults that seek only the best in retirement living. With just 160 attached and single-family homes built from 2007 to 2014 by K. Hovnanian, Four Seasons at The Promenade has a very desirable Warren Township zip code. This area was settled in the early 1700s and is situated in the breathtaking Watchung Mountains. Warren is also surrounded by recreation areas like Passaic River County Park, which offers amazing hiking trails. Golfers can head out to nearby courses like Warrenbrook Golf Course, while Manhattan is only 35 miles away. There are 38 townhomes on the property, they include two or three bedrooms, two to three-and-a-half baths, and two-car garages. All come with first-floor master suites, while some have decks or patios. There are four single-family home models sized from 2,500 to 3,200 square feet. They have three bedrooms, two to three-and-a-half baths, and attached two-car garages. These have full basements, gourmet kitchens, and first-floor master suites. The attractive community clubhouse has indoor and outdoor pools, a cozy lounge, a fitness center, and an outdoor patio. Homeowners here also enjoy the private walking and biking trails, lakes, ponds, and employing their green thumbs at the seven community gardens.